Stop at our booth to add a little fresh history to your shopping list! And if it's produce you want, we'll even give you a chance to grow your own! The Lakewood Farmers Market adds more vendors and attracts bigger crowds every year—and your Society has been in the thick of it this summer. You have one last chance to catch us: September 13, our last vending for 2016 of fresh, organic historical nuggets to all who stop by our booth for. Take all you want—they're free! Join us for one last dive into those hazy, lazy, crazy days of Summer! 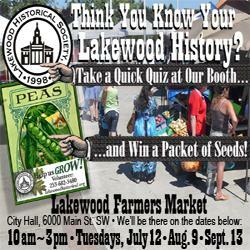 The Society's booth, staffed by our peerless volunteers, will let you test your knowledge of Lakewood trivia and give you a chance to win our daily drawing! 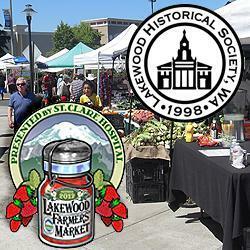 Again, look for us among the vendors in front of Lakewood City Hall, 6000 Main St. SW, on Tuesday, September 13.